Stop mice from overrunning your home with the Bonide No Escape Mouse Traps. These straightforward traps set and bait with ease, without requiring any poisons or other harsh chemicals, for use even in food storage areas. Place the wooden bases perpendicular to a wall where you have seen mouse activity, and add bait such as peanut butter or cheese to the wells on the metal pans. Pull back the bows and pedals to set up the units, and check them regularly. The metal spring and locking bar on each will last for several captures, and the small size of the traps offer a wide area of coverage. 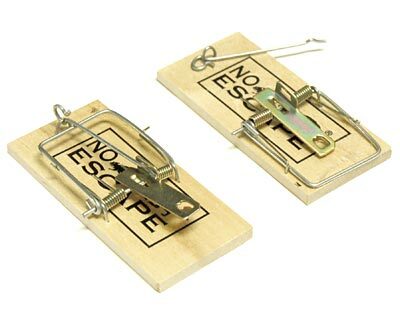 Eradicate mice in your home with these No Escape Mouse Traps.